Olivier and Graham are delighted to welcome Lauriane André and Jérôme Desprès from Domaine des Terregelesses – Françoise André to Dax on Thursday 11th April for a very special evening of premier Côte de Beaune wines and fine food. In the heart of this ancient duchy the golden slope resides. 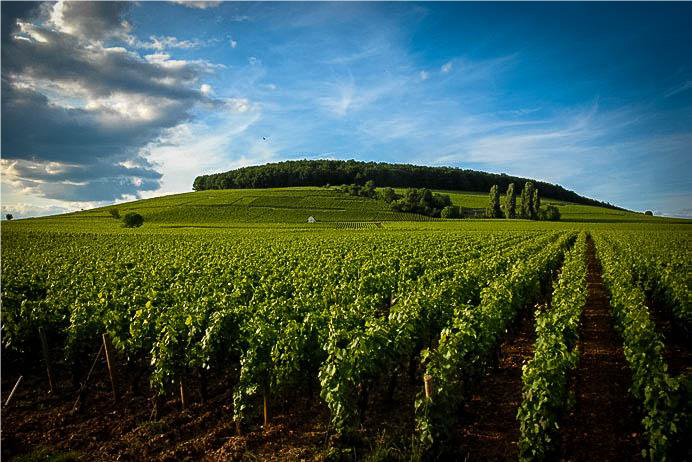 The Côte d’Or is not just one vineyard, the northern half is the Côte de Nuits; its southern half is the Côte de Beaune. Following a geological fault-line the Côte d’Or is layered with calcareous brown and gley earths overlying soft and hard limestone. A warren of domains, villages and estates producing exemplary wines, around the Bois de Corton it reaches its peak. To the south and east of the hill is Aloxe-Corton with Pernand-Vergelesses hugging its western side. It is here, in parcels of land that is typical of the region, that the domain of Françoise André is found which includes the evocative Grand Cru Corton-Charlemagne vineyard. This family estate, managed by Lauriane André with the help of Jérôme Desprès, spans over 7.5 hectares around the famous Corton hill. Organic and Biodynamic, the estate lives according to the rhythm of the vines. It excludes all chemical products to preserve the true nature of the grape. Producer of a rich and splendid selection of wines, they are the first in Bourgogne to have claimed the appellation Chorey-Les-Beaune blanc and to have bottled it. The single vineyard Pommard “Les Vaumuriens” once belonged to Coche-Dury, who put it up for sale it 5 years ago and picked the Domaine Francoise Andre from many contenders as the new owners of this prestigious vineyard. This says much about this estate! The wines are made from single vineyards and we will also taste different vintages all together to show the wines ageing potential. The evening begins at 7pm with Canapés and Chorey-les-Beaune White “Tue-Boeuf” reception. Sit down for dinner at 7:45pm. Lauriane (and weather depending Jérôme) will be presenting the wines during the dinner. The fully inclusive cost is €175 euro per person which includes six top wines, canapés, a four course dinner created by Graham Neville and his team. Please note this is an open sitting dinner, you will be sharing tables. Places are limited to 51 people over six tables, you will be sharing tables with fellow diners. Wine making/ageing The harvest is done manually with a meticulous cluster selection. Whole grapes are then pressed in a pneumatic press. The slow and steady pressure increase of the press produces fine and elegant wines. The settling process (separating the must from the solid particles) is thorough, contributing to the wine’s excellence. The must (the juice extracted from the grapes) begins its alcoholic and malolactic fermentation in 350 litre barrels. 30% of the barrel is renewed annually: a voluntarily moderate renewal to let the terroir express itself. Hand in hand with our Coopers, we seek the perfect equation between the type of barrel and the wine’s character. Average yearly production 1050 bottles. Millésime 2009 Pure liquid gold, almond paste aroma, a fruity and fresh attack that makes room for a mouth-filling fattiness with the perfect length. Drink it today with a cream risotto or age it until 2014. Millésime 2010 If white gold became liquid, that is what this wine would look like. The nose hosts a wealth of tempting details (fresh hazelnut, hawthorn and rose hip). As soon as it hits the palate, it offers up its supple body of nectarine fruit. Its finish tightens up on a tonic note of lemon, making it the perfect addition to a salmon tartar with citrus fruit for another three years. Millésime 2011 Its white gold juice enhances the tantalizing notes of white fruit (nectarine, pear) with a subtle touch of cinnamon (legacy of its barrel). Round and fruity, it travels towards a pear candy flavour, making you want to share as soon as the occasion presents itself. Millésime 2012 As often with excellent Chorey wines, hazelnut is the dominating note. Its golden robe is more intense than in 2013. As soon as it hits the palate it displays a dry tannin similar to a red wine. The wood notes balance it out with a cinnamon finish. If you drink it within the year, be sure to decanter it. Millésime 2013 Under a veil of white gold dances the aromatic character dominated by hazelnut. Its generous attack gains precision with its juice imbued with citronella. Delicious with lemon-stuffed quail. Millésime 2014 From the golden green finery emanates a perfume of blooming acacia and a hint of hazelnut. After its dynamic attack, this wine presents the invigorating mouthfeel of lemon. Its delicate acidity flows over your taste buds to reveal its saline finish. Vibrant. Average yearly production 1000 bottles. Millésime 2010 While golden tendrils fall the length of the glass, soft fragrances of flowering shrubs and honeysuckle float from its surface. The attack is made lively by the ample smoothness that caresses the tongue before finishing with refreshing salinity. Perfect for brightening a plate of goujons. Millésime 2011 The fine gold of its juice grabs your eye before bringing your nose on a path where fresh hazelnut and blooming wild rose abound. On the palate it begins rich and crunchy like a white peach before letting its mild acidity appear. Open it now or after a winter. Millésime 2012 Its brilliant golden coin appearance heralds water flower and rock moss aromas. Surprisingly full-bodied for a village appellation, this wine draws from the Jurassic layer of the soil. Its salt and pepper finish carries the mouth away on a road of pleasure. Millésime 2013 Its pale yellow blanket wraps around the glass and reveals wisps of white flowers such as acacia with a touch of its honey. Crunching green pear as soon as it hits the palate and with a saline finish, this wine proves just how much immediate pleasure a village appellation can give. Average yearly production 2600 bottles. Millésime 2009 A pure yellow with radiant sparkle fills the glass with fresh hazelnut and blooming mayflower. Its body is round and opulent. Ready to be enjoyed with salmon en papillotes. Millésime 2010 The soft sparkle of silvery gold ripples in the glass. This cuvée allows you to indulge in the heady perfumes of Bourbon vanilla and sweet yellow flowers. Once on the palate it reveals the structure of a mature wine with large shoulders. Perfectly suited to embellish pan-fried veal chops in cream with mushrooms this winter. Millésime 2011 As usual, this Prince of Cru merits its title. Its subtle fragrances of white flowers (acacia, honeysuckle and almond) rule the glass with elegance. Its rich and earthy composition unveils a refreshing, delicate mineral character. Royal from the attack to the finish, this wine is worthy of the finest of fare. Millésime 2012 Its bright golden gown expresses notes of salt butter caramel. Its firm and tight character like that of a stone stuck in clay gives insight into the years of great ageing to come. Expect at least four to five years before bringing it out of your cellar for a delicious sushi dinner. Millésime 2013 The white counterpart of the estate’s red wine, this Chardonnay with the golden crown showcases aromas of toasted hazelnut and flowering almond trees. Its initial is round on the palate and its body is generously laden with yellow fruit tending towards Bergeron apricot. Irresistibly delicious, it will be difficult to wait for it. Millésime 2014 Although its robe is dazzling lemon yellow, it is the fragrance of fresh, green almonds that fills your glass. Its initial taste will stun your taste buds with the frankness of its juice, finishing with a fleur de sel iodine note. Lively. Wine making/ageing The harvest is done manually with a meticulous selection of the clusters. Destemming is extensive, only 10 to 15 % of the stems can be kept from the well-ripened cuvées to add a note of aromatic freshness. The pre-fermentation maceration period lasts around 4 days, during which daily crushing and pumping is done. The objective of this controlled, supervised maceration is to encourage the optimal extraction of elements from the skin and to limit, as much as possible, the addition of unwanted elements from the seeds. Racking takes place 15 days following the grape harvest. The must is then aged in 228 litre barrels. 30% of the barrel is renewed annually; voluntarily moderate as to let the terroir express itself. Hand in hand with our Coopers, we seek the perfect equation between the type of barrel and the wine’s character. Average yearly production 3300 bottles. Millésime 2009 A dazzling deep ruby red draws you in while budding black currant and morello cherry perfumes lead the way to a mouthful of sweet cherry juice. Enjoy it today or in 2015. Millésime 2010 A bright ruby robe mirrors its perfume, floating from rose to violet and hinting at a basket of black cherries. Brand-new wild fruit (primarily raspberry and blueberry) explode on the palate, underlined by a subtle acidity that begs to be enjoyed with duck breast. Millésime 2011 From under its Pinot robe, it gives away a bouquet of ripe, small red berries with a touch of summery violet. Rather sapid on the palate, it slides over the taste buds with a subtle cherry flavour before concluding the motion with a touch of menthol. Ready for sharing, this village appellation has what it takes to age until 2016. Millésime 2012 Don’t let its light cherry colour mislead you; its nose is surprisingly overflowing with blackberry perfumes (rubbed blackcurrant and blueberry). Deliciously enticing right from its attack, this wine offers a generous tannin and a mouth-watering saline finish. Young or old, it will seduce scores of palates. Millésime 2013 Decked out in a light cherry garment, it offers a woody nose with mocha accents and a touch of raspberry. This small red berry is echoed on the palate with a fruity display that will startle your taste buds with its acidulous aspect. For lacquered duck breasts. Millésime 2014 Everything that distinguishes Savigny is in this bottle. A classic Pinot robe with notes of small red berries (raspberry) and violets. Full-bodied fruit and lively tannins ring in your mouth while the finish gives insight into the ten years to come. Enticing. Wine making/ageing Pommard “Les Vaumuriens” once belonged to Coche-Dury. The harvest is done manually with a meticulous selection of the clusters. Destemming is extensive, only 10 to 15 % of the stems can be kept from the well-ripened cuvées to add a note of aromatic freshness. The pre-fermentation maceration period lasts around 4 days, during which daily crushing and pumping is done. The objective of this controlled, supervised maceration is to encourage the optimal extraction of elements from the skin and to limit, as much as possible, the addition of unwanted elements from the seeds. Racking takes place 15 days following the grape harvest. The must is then aged in 228 litre barrels. 30% of the barrel is renewed annually; voluntarily moderate as to let the terroir express itself. Hand in hand with our Coopers, we seek the perfect equation between the type of barrel and the wine’s character. Average yearly production 1300 bottles. Millésime 2013 The dark purple of its garment expresses powerful fragrances of ripe plum. Its initial taste of firm tannins displays a wild character where a strong tannin encircles the entire mouth. Three years in the dark corner of a cellar will tame it. Millésime 2014 The fragrance of musk and vetiver beneath a magenta red juice already expresses its cold personality. Its brawny consistency shows off its strength. Its finish is ample, uplifted by its perfect maturity. Patience is required in order to appreciate the finesse of its nature. Intense. Average yearly production 1750 bottles. Millésime 2009 Limpid, brilliant gold attracts the eye. The nose offers a delicate bouquet of white flowers and pear. The first impression in mouth is smooth and rich with its vanilla whipped cream flavour. The finish proves by its length that it is indeed a grand cru. Millésime 2010 Brilliant gold coats the cup while you swirl your glass, bringing out the fine and complex flavours of flowering shrubs (hawthorn and acacia) as well as rubbed flint. Its opulent body of whipped cream flavour brings you to a “salt and pepper” finish, like the beard of Charlemagne. Even if today, this wine is princely (it can immediately be poured with grilled lobster at the next event), it will be crowned Emperor after reigning for five years in your cellar. Millésime 2011 This Grand Cru doesn’t only glow in your glass, its perfume of pure, fresh almond finds its balance in the blended woodsy notes. The distinct mouthfeel comes from the dry extract content similar to that of a red wine. Retro-olfaction reveals its nobility rooted in its iodine character. This is the Chardonnay for precious moments. Millésime 2012 Set in a golden green chalice with pale highlights, this wine expresses a floral bouquet marrying lime tree and the finesse of white flowers (acacia and wild rose). Decidedly limestone with a marly mid palate straight from the earth, it disgorges its soil in a mineral finish that cuts like a sword. If you can’t wait ten years than you will have to carafe it. Millésime 2013 In the glass of this hill-bred Emperor, its imperial flourishes in flowers of juniper, bracken and cinnamon with a touch of rubbed flint. Its taste is generous and the opulence of a Grand Cru is dramatically uncloaked at the finish. It can be enjoyed while young, but only if previously carafed, or it can be forgotten for a few winters in the depths of your cellar. Millésime 2014 If the Emperor’s beard appears white, it is simply because the tiny flowers which grow in stone walls and the dried fruit of hazelnuts and almonds have fallen into it. Right from the beginning, it’s the dry extract that upholds the palate like a tannin buttress, majestically prolonging the moment. This vintage is already a classic. Timeless. This month we have some excellent new autumn menus from Chef Graham Neville. We are open for pre-Match lunch for the Ireland v Argentina game on the 10th November, tables still available so get booking before they’re all gone. As Christmas approaches we have a pre-festive season sale on Dax Gift Vouchers…10% off until the end of November. 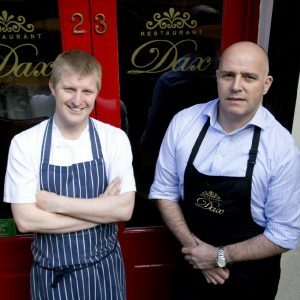 A reminder that Dax will be open especially for lunches and dinners on Mondays and Saturdays in December. Ireland clash with Argentina in the second of this year’s Autumn internationals and Dax will be open for pre-match lunches from 1pm. We have a few tables left available to book. Graham Neville’s November menus are now available to view online. The set lunch menu has dishes of Thomas Salter pork belly, Wicklow venison and roast Mallard. Still excellent value lunch time dining at 29 euros for two courses and three courses for 35 euros. As alway there is a Lunch A la Carte menu too, view both below. Beautifully printed on sturdy card so they are a real gift to hand over to the foodie or self indulgent; we think they look excellent under the tree. 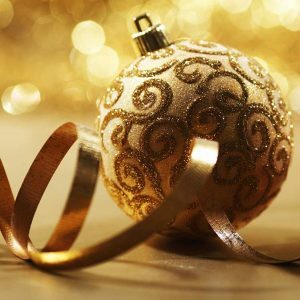 Have you booked you office Christmas dining event’s yet? Don’t forget that Dax will be open more days in December than our normal schedule. Ireland are getting ready for a huge home showdown this November! 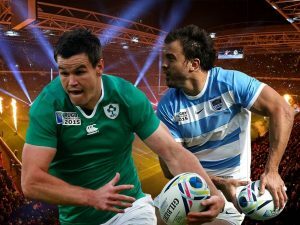 Join us for a pre-match Rugby Lunch before Ireland see off the Argentinians! We have a few tables left for the Argentinian game. So please book early to avoid disappointment! 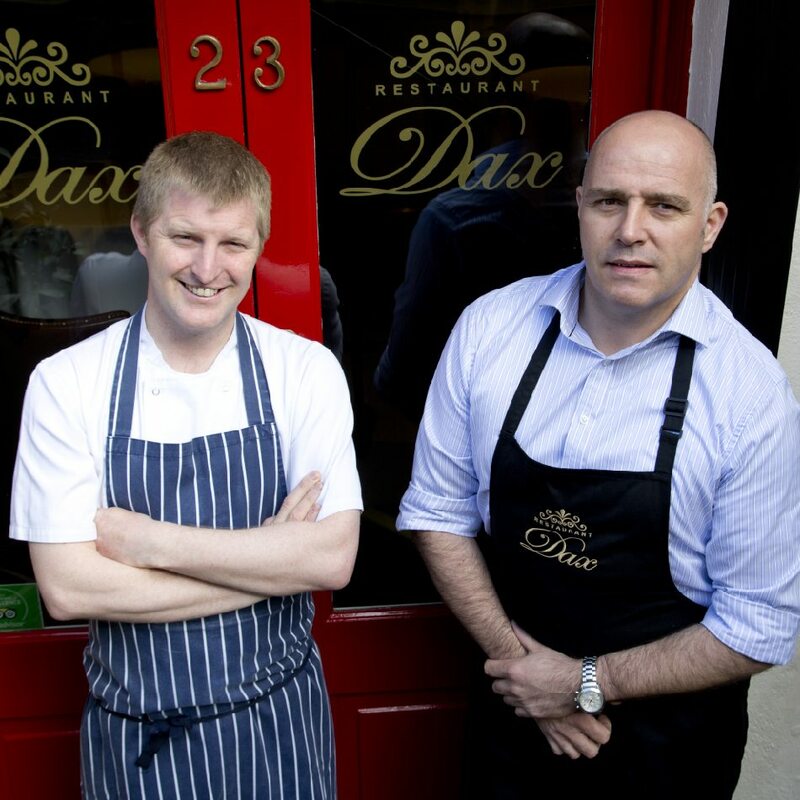 A Gift Voucher from Dax will make the foodie in your life very very happy! Available to purchase online with ease our vouchers are printed on card so you have a tangible gift to hand over. Once the order is received the voucher will be posted out to the address requested or alternatively you can collect in Dax. 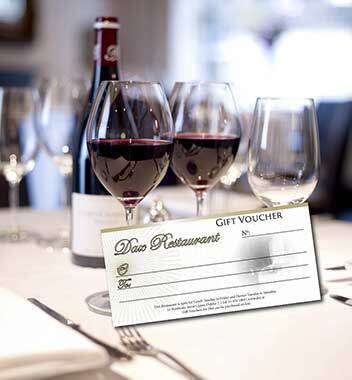 There is no expiration date for the voucher and they can be used at any time throughout the year for lunch or dinner in Dax. 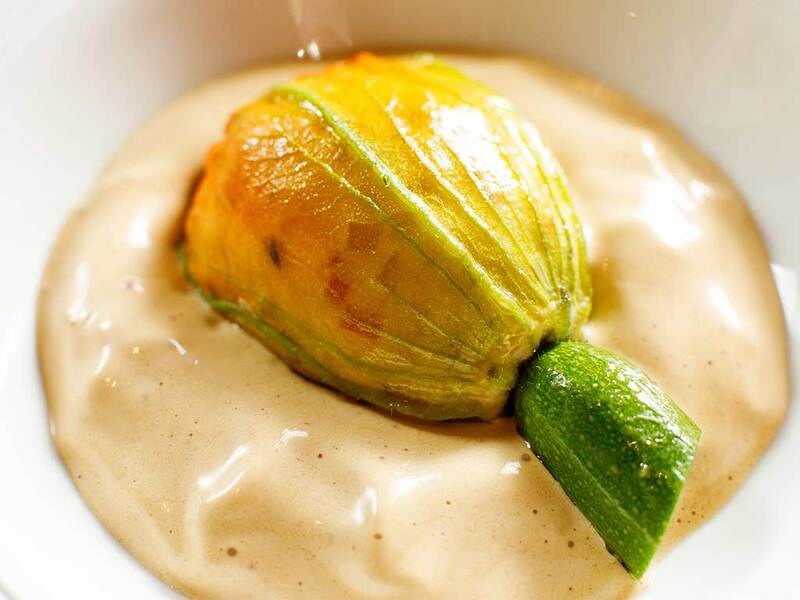 …on Ireland and everything is blooming, including the courgettes, so sees the return of one of Chef Graham’s signature dishes to the menu. 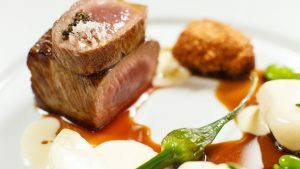 Our new summer A la Carte dinner menu includes dishes of Rose Veal Tartar, Toonesbridge Mozzarella, Roasted Moulard Duck and Blackstairs Spring Lamb along with much more. Chef Graham Neville’s new summer set lunch and A la Carte lunch menu is published and available to dine from Tuesday 19th June. A la Carte lunch is a short menu in addition to our set lunch menu and is available every Tuesday to Friday from 12:30pm. Just a quick note to remind you all that Dax will re-open for lunch on Tuesday 9th January from 12:30pm. Served Tuesday to Friday from 12:30pm and when Ireland is playing at home in a rugby international on a Saturday.